A criminal complaint shows that a suburban Chicago man may have posted his intentions on Facebook before allegedly setting fire to an air traffic control center that led to ground stops at O'Hare and Midway international airports Friday morning. Federal authorities have charged Brian Howard, 36, of Naperville with one felony count of destruction of aircraft or aircraft facilities. According to the criminal complaint, Howard, a contract employee at the Federal Aviation Administration Air Route Traffic Control Center in Aurora, entered the facility at 5:06 a.m. dragging a black hard-sided roller board suitcase. About a half hour later, law enforcement officials were alerted to Facebook messages posted on Howard's account referencing ZAU, the call number for the facility. 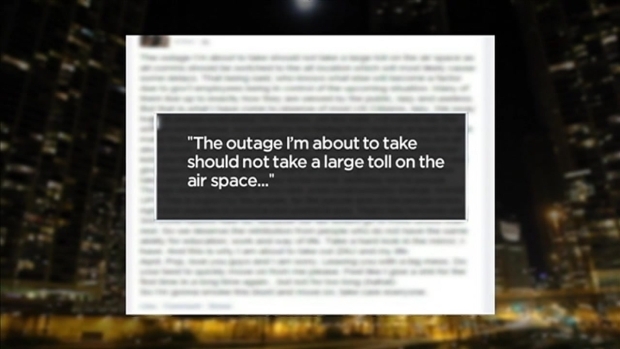 9/26/2014: Facebook post linked to Brian Howard said he planned to create outage and take his own life. NBC 5's Phil Rogers reports. "The outage I'm about to take should not take a large toll on the air space..."
"All comms [communications] should be switched to the alternate locations, which will most likely cause some delays." "I have no faith, not in humanity anyway. This is why I'm about to take out ZAU and my life." According to the criminal complaint, a relative forwarded the Facebook post to the Naperville Police Department which forwarded it on to the Aurora Police Department. At about 5:42 a.m., officials with the Aurora Fire Department sent crews to the facility after receiving a call from someone inside. Two first responders entered the basement of the facility and followed a trail of blood that ultimately led to an individual later identified as Howard, according to the complaint. Authorities say the paramedics observed a gas can next to a floor panel that had been pulled away, the nozzle from a gas can, burned towels, a lighter and two bloody knives. 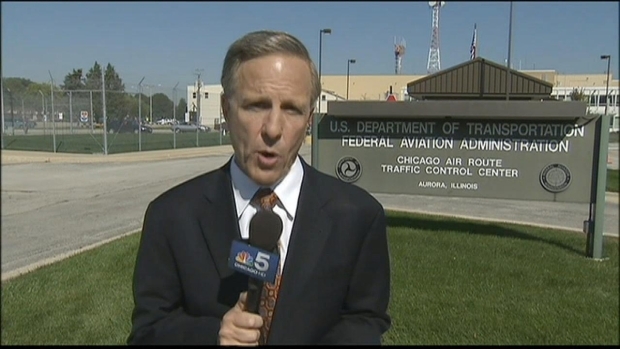 9/26/2014: Neighbors of the Naperville man suspected of setting fire to an FAA facility are surprised he's implicated in the incident. NBC 5's Tammy Leitner reports. The paramedics say Howard was shirtless, laying underneath a table with knife wounds on his arm, and was actively slicing his throat with another knife. The paramedics pulled the knife away and began to treat Howard over his objections, according to the criminal complaint. The fire, set in a communications area, was quickly extinguished. Agents from the ATF, the FBI and the DuPage County Arson Task Force were later called to the scene. A source told NBC 5 that Howard was contracted to take part in a massive revamp of FAA telecommunications and data systems. He reportedly was unhappy about being transferred to Hawaii. Authorities searched Howard's home Friday and found "legal documents that had been laid out in a staged manner, in an attempt to make them easier to find." Colin McGrath said he never suspected his Naperville next door neighbor was having problems. "He just seem like a normal guy. I can't stress that enough, he just seem like a normal guy," McGrath said. Other neighbors say Howard lived alone, kept to himself and went to work every morning. Between 15 and 30 people were evacuated from the building, and a man in his 50s was treated for smoke inhalation at the scene, officials said. The incident prompted the cancellation of approximately 2,000 flights in and out of O'Hare and Midway airports, the Chicago Department of Aviation said. 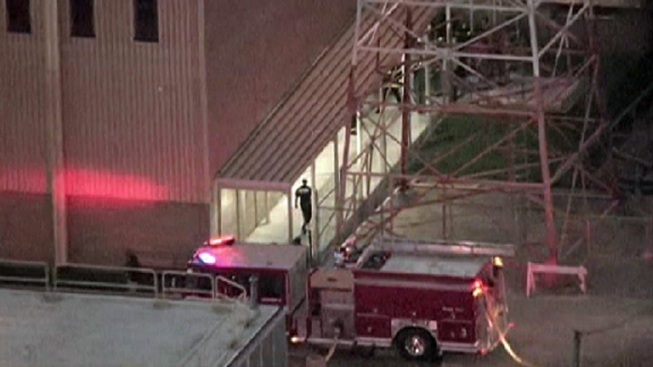 9/26/14: A fire at a Federal Aviation Administration facility in suburban Chicago that stopped flights Friday in and out of O'Hare and Midway international airports was intentionally set by a contract employee, police said. Phil Rogers reports.